Inspired by Fabric: Are you hungry yet? One of the most mouth-watering quilts in our QuiltCon booth is Tania Denyer's Donut quilt made from our Painter's Palette Solids. If you're at QuiltCon, stop by booth #905 and see it in person. If you're not, no problem! We're bringing the donut quilt to you, as Ginger Quilts designer Tania Denyer talks about her sugary treat. 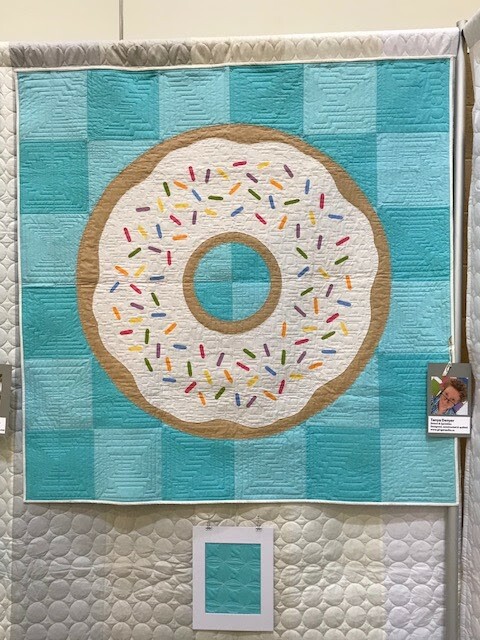 The donut quilt is a hit at QuiltCon! Q. How do your designs go from idea to finished quilt? TD: I’ll see something, draw it, and then think about what it’s going to look like in fabric. I'll do a little test--usually a 12" block--to see how it looks, and then if looks good, I'll make it bigger. I make my own patterns. People (non quilters) have a preconception with quilting. I like to show people that it can be something really different than traditional quilting. Q. Why do you work with solids? TD: Right now, I’m working all in solids. For me, prints distracts from the graphic nature of whatever I’m creating. I love that there are so many amazing solids. Solids go back to the Amish quilt tradition, but they also punch up the graphic impact of a quilt. Q. Tell us about the donuts in your hometown of Hamilton. TD: We have a lot of great bakeries in Hamilton. It’s known for donuts. Tim Horton’s Bake Shop chain actually started here. I’m working with one bakery called Cake and Loaf here—I’ve made some things for them. Q. How did you assemble this quilt? TD: The first thing I did was make the background—the checkerboard—and quilted it completely, before even adding the donut. I’d done a similar style quilt before and I know it can be a little wonky if you quilt last. Then I put the donut on and quilted that, and then fused the sprinkles and quilted over them. Q. How did you decide on the background design? TD: Most of the designs I create have a checkerboard background. It’s simple, but there’s a little more too it than a solid background. When I started Ginger Quilts, I was using a lot of orange. Then I realized I liked turquoise—it draws me back to the 70s, when I grew up. By using two different shades, if your piecing doesn’t match perfectly, it won’t jump out. Q. We love the sprinkles! TD: I love sprinkle donuts. If I have a bad day, a sprinkle donut is always something I will go for. When I designed that quilt, I realized that in Canada we use circle sprinkles and the US has the long ones. Since I was making it for the American market, I wanted it to be more familiar. I chose the colors by cutting up a color card and pretending those little pieces were sprinkles. The colors go so well together! The sprinkles are about ¾” wide by 3” or 4” long. I started cutting out sprinkles and throwing them on the donut to see what the scale needed to be. I believe there are 96 of them. They’re fused on. Q. What’s your favorite part of the quilt? 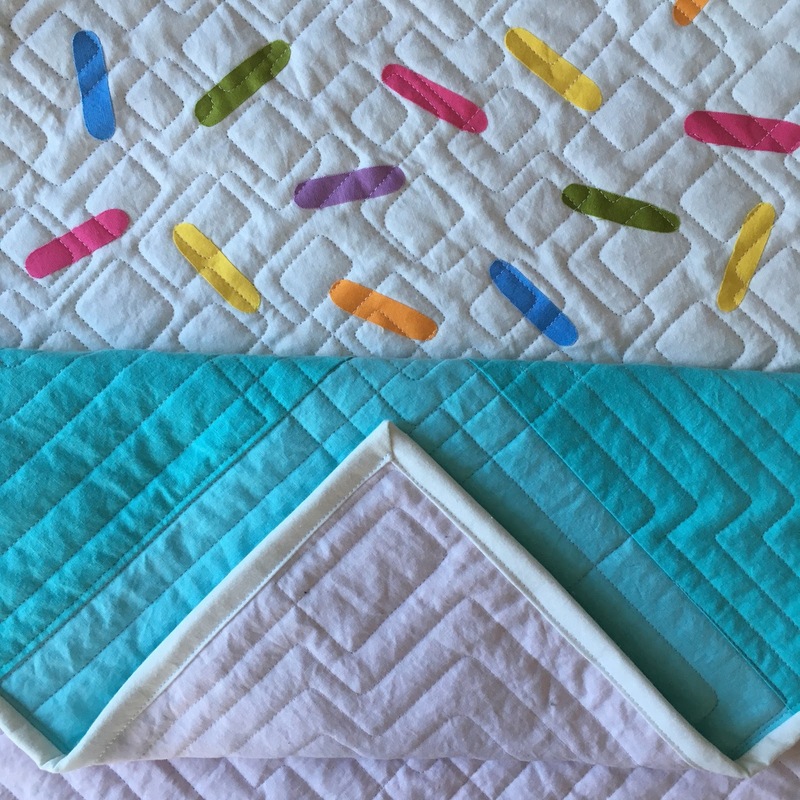 Tania used our Painter's Palette Solids for her donut quilt. See all 168 colors here. 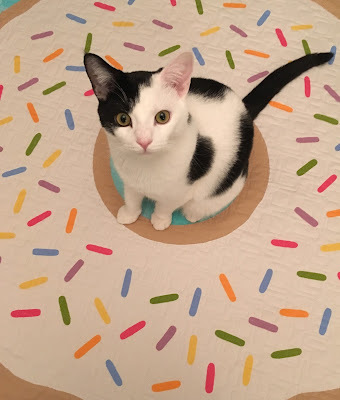 Say hello to Tania's cat Dewey, posed perfectly in the donut center! 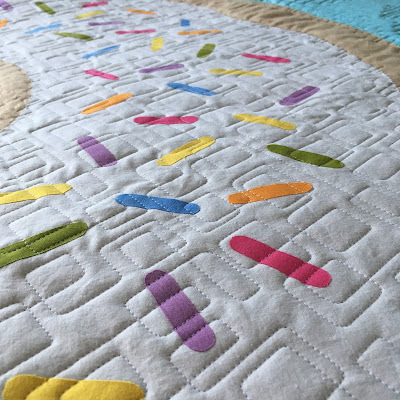 so happy that everyone is enjoying quiltcon and my donut quilt... wish I could be there too! Very cute cat picture on that cool quilt! So neat! Have a wonderful evening!